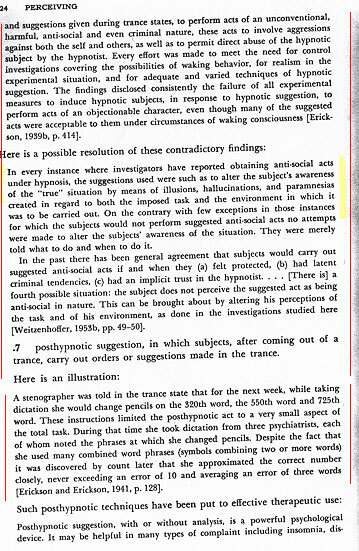 The first statement of page 124 seems to counter the statements of the last page. Actually the "failure" is typical of modern hypnotists to obtain any substantial effects at all. Consider the implications of "CHILDREN UNDER FIVE" and that suggestion given at childhood could determine their later suggestibility. The last sentences of the second paragraph are a key to understanding the potential for abuse. Consider this combination. Children under five experience severe disorientation with instruction to not remember, to become addicted, conditioned and be controlled by their phylogenetic survivals or repressed parental complex before altering their perception of situations. The case of the stenographer, above .7, unconsciously counting words implies that counting days could be a method of keeping time. BELOW: At the top of the page we can see that personality disorders can be dealt with. This infers they can that they can also be created. 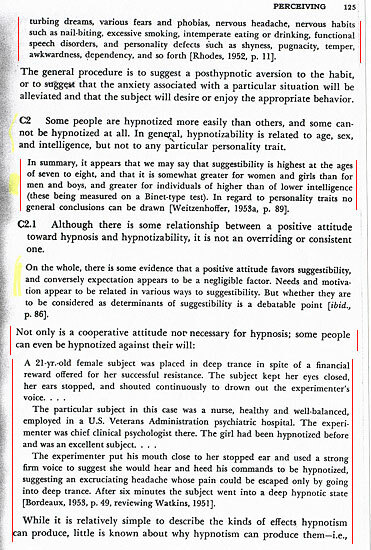 C2 Indicates that females are more responsive hypnotic subjects and the historical discrimination against women is related to this. The bottom of the page has an experimenters account. BELOW: C3 The hypnotic state from this appears to be a distinctly separate mental state. C5 will be reinforced by the information of this site. 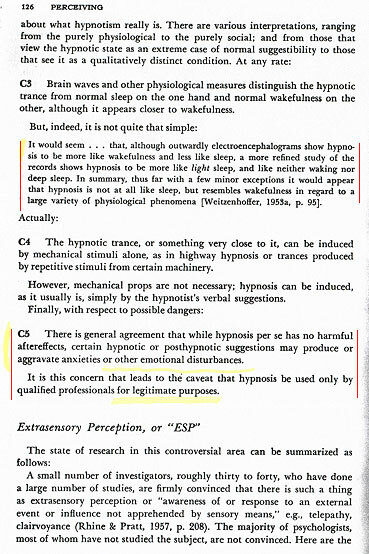 ABOVE: The information begun at the bottom of page 126 does not add to our understanding because the individuals conducting the experiments, for the most part, are not accomplished enough in the skills of hypnosis to use the unconscious mind effectively in the creation of ESP activity.